Important Notice: Lithium-Ion Item - Express Delivery option not available due to transportation regulations.The M18 FUEL 4-1/2 in. / 5 in. Paddle Switch Grinder supplies maximum sustained power to complete the toughest grinding, surface preparation and cutting applications. The POWERSTATE Brushless Motor provides up to 10X longer motor life and lower cost of ownership. The M18 REDLITHIUM XC5.0 Battery Pack delivers up to 4X more run time and 20% more power. 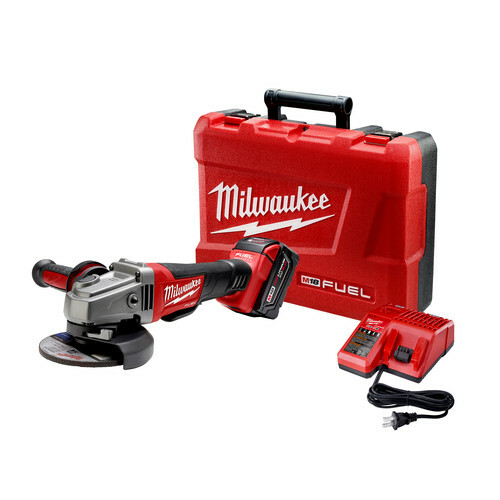 The grinder features REDLINK PLUS Intelligence, the most advanced system of cordless power tool electronics, for maximum performance. The world's first cordless grinder delivers the power of a corded grinder with up to 2X more run time and up to 10X longer motor life. I bought this because we are building a house and don't have power yet. I needed something to cut 1/2" rebar and didn't feel like shelling out the bucks for a generator just yet and needed something to replace my cheap electric angle grinder. The weight balance feels good. I really like the quick adjustment for the guard. This thing cuts through 1/2" rebar so quick I was surprised. Another feature I like is that when you release the paddle handle the blade stops immediately. Really a nice feature. Very happy with this purchase. 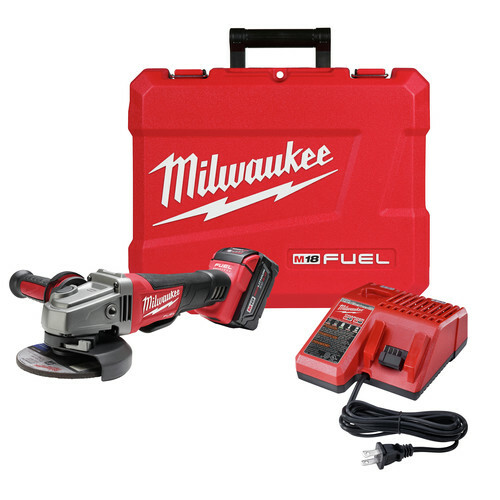 Milwaukee tools are worth the premium over the stuff you find at the discount big box store. The cordless grinder will make all my future grinding and cutting jobs a breeze.My old grinder had an appetite for the cord and liked to get me all tangled up. I will now be able to concentrate on the task at hand. And this cordless grinder will be an extension of my hand. Does this kit come with the 4.0 or 5.0 battery? Interested in knowing the arbor size (for specifying cut-off wheels). I believe my current is 7/8". I assume that this tool uses thin cutoff in addition to other thicker wheels for steel and concrete? BEST ANSWER: the arbor size on this unit is 5/8-11.